I cant Imagine of how many millions of people as of today are using CELLPHONES. The generation of Cellphones are getting bigger and bigger, every second millions of it are sold from our market. It seems that many of Us looks like they consider it as one of those basic needs. But let us not forget that we can still live without it. It is important but let us not consider it as a basic needs.As you can notice, since you bought your cellphone, did you have a day that you stop texting? Or even a minutes to limit your self on stop watching your phone? So if you can not limit your self on texting, And you think you can't do anything without your phone. Sad to say You are now a CELLPHONE addict. 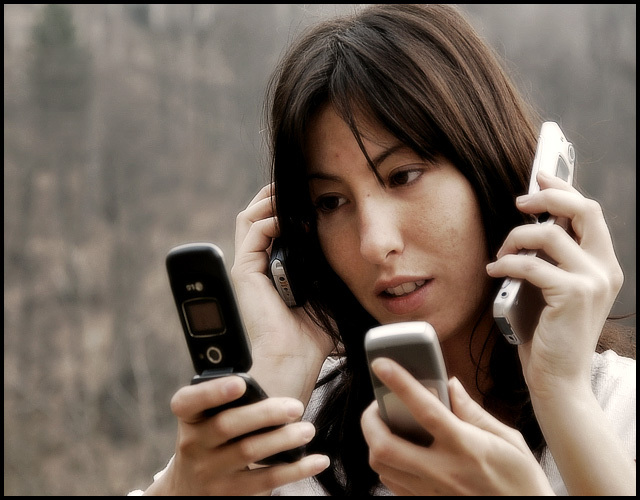 Well being an Cellphone addict have several effect on our body or even on our emotions, and can even end up with death. 1) Possibly Carcinogenic - we can get this from the radiation of our phones, carcinogenic means such substance or agent that tends to produce a cancer. An that was recently assessment and published in 2007 by the European Commission Scientific Committee on Emerging and Newly Identified Health Risks (SCENIHR). 2) Cataract - the cornea of the eye does not have this temperature regulation that is why too much looking on phones LCD can cause cataract. 3) Blood-brain barrier effects - A study from Lund University (Salford, Brun, Persson, Eberhardt, and Malmgren) a Swedish, They studied that microwave radiation has a bad effects on rats brain it can leak the albumin into the brain via a permeated blood-brain barrier. And can cause Brain cancer. 4) Hypersensitivity - a feeling on which your so hyper, can't sleep and very strees. That was only numbers of Effect on being cellphone addict. In order to overcome this kinds of addiction some of scientist study about on how to control this uncontrollable addiction. Professor Cary Cooper, an expert in psychology at Lancaster University, UK,, Said that it is very hard to stop this kind of problems, but he said that we can limit it. Follow my tips on how to limit your CELLPHONE ADDICTION. 1) Self discipline - discipline your self to limit your money on buying loads, and also limit your self on time of text, or phone calls. 2) Interact with People Personally - By means of this you'll be having more time interaction with your friends or family and forget your phone for a minutes of time. 3) Exercise and Sports - More of exercise and dont bring your phone. Do Sports, It can enhance and create feelings of pleasure and can treat the depression that may occur due to excessive use of phones. 4) Using Phone Wisely - You must know when and where you use your phone, use your phone for important things, and learn when you have to stop it. It is much better to interact personally than using your phone gradually. "Always remember that everything has limitation, and consider all things to its limit to be useful for you and for all." Mobile Phones are great tool for communication! So if used the right way it will be an effective tool and not to worry about the bad effect!